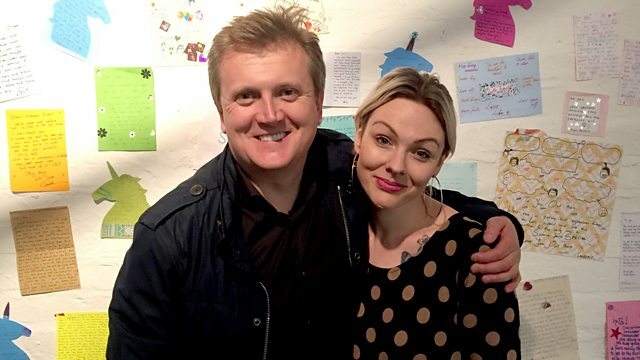 Aled Jones meets Jodi Ann Bickley, founder of the One Million Lovely Letters project, who has written thousands of letters to people around the world in need of support. What could possibly motivate someone to want to write a million letters to complete strangers? As part of BBC One's Our Lives, Aled Jones meets Jodi Ann Bickley, 'the girl who writes letters'. Jodi, who has ME and anxiety, set up the One Million Lovely Letters project in 2013 and has since written thousands of letters to people around the world, offering support to those who need it. Jodi Bickley from Birmingham, started writing letters when she was just five years old. She was encouraged to write a letter to her grandmother who had just passed away - it was a letter to an angel. From then on Jodi began to write letters and notes to strangers. She would leave them on busy Birmingham buses, in coffee shops, shopping centres - anywhere where they could be found and potentially brighten up someone’s day. But after being bed-bound for a year and half from encephalitis, and severely suffering with her ME, it all got too much - and she prepared to kill herself. Luckily an app which she'd downloaded to cheer herself up on bad days pinged her back to life, making her laugh - something she hadn’t done in a very long time. If something so small and uplifting could change her mood dramatically maybe she could do the same for others. Jodi decided to set up her website to help people who were feeling just like her. Jodi then started her website, One Million Lovely Letters, to help people in need of support just like her. Anyone wanting a letter can request one via email. Her aim is to write to one million people, and help them in any way she can with her kind and uplifting words. Since starting the project in 2013 Jodi has written more than 4,000 letters to people all over the world and currently has a further 8,000 requests in her in box. Jodi's Lovely Letters is part of The Our Lives season on BBC One. She has written more than 4,000 letters to people all over the world and her aim is to write a million. Jodi Ann Bickley, from Birmingham, set up the One Million Lovely Letters project in 2013. Her inbox has thousands of requests from people wanting letters of support from her.